A Little Question… Should You Travel With a Laptop? Working with a wifi dongle on my laptop from the middle of the Jordan desert! This is one of those ever-present questions for new travelers—should you bring a laptop on your round the world trip? There’s actually a lot to think about before you set off overseas with a computer in tow. For some, it’s an easy answer. If start your own travel blog then carrying a computer is a no-brainer—you need a laptop with you. Likewise if you’re a freelancer working from the road (this has been me for a decade! ), then you also absolutely need it (but then, digital nomads already know that a laptop is the price of their freedom). But if you’re somewhere in between—maybe you plan to record your trip on Instagram, pick up some small work assignments as you go, or you hope to watch Netflix on the road—this post will help you consider the pros and cons of traveling with a laptop, as well as the best alternatives that may just get the job done without the commitment of a full computer. Going as light as possible on electronics can be incredibly liberating for long-term travelers. If you’re planning to travel the world, this might be the perfect opportunity to force yourself offline. The fact is, most travelers these days have a smartphone, so bringing a laptop might be overkill for your trip. Did I carry a laptop? Yes, I brought my computer with me on my yearlong RTW trip, and for every year of the past decade that I have stayed on the road. What’s more, I cannot imagine traveling without it (my heart stutters at the thought). But I did not take a traditional RTW trip. I have worked as a freelancer since I left in 2008, so my trusty Macbook kept me on the road (although it was a Dell for the first few years!). If you’re prepping for a traditional trip around the world, or if traveling abroad for a few months, consider these pros and cons of bringing your laptop on an international trip. Safety is a big concern. And I don’t mean personal safety—when you pack gadgets galore then you have to come up with ways to keep your electronics safe. For me, that meant a bringing a PacSafe on my any budget backpacking trip and securing my backpack when I left my laptop behind at hostels and budget guesthouses. In more recent years, I travel more mid-range, and the PacSafe is no longer needed since I don’t share spaces. You spend more time on the computer. If you have a laptop then you’ll likely spend more time using it than you might have otherwise. That means possibly getting sucked into technology when you could be out meeting new people, playing cards with others at your guesthouse, and generally exploring. You’ll worry. This ties into the safety concerns, but you have a much more heightened sense of worry. Even with the PacSafe, I was nervous whenever I felt my laptop wasn’t truly safe at the guesthouse or hostel. (Disclaimer: Most of my worry stems from my laptop’s role as my key source of income on the road; as a freelancer I cannot afford to lose my laptop in the middle of a project). It’ll weigh you down. In the backpacking world it’s all about packing light. Less is more. There are even “my pack’s smaller than yours” type of debates among those who care. Even if you don’t, prioritize truly minimalist travel, a laptop means more weight in your pack and on your back as you hike to hostels, chase down chicken buses, and make a mad sprint for your train. It’s hard to stay ergonomic. I developed serious RSI and carpal tunnel from my years working from the road. Because of that, I still travel with a laptop, but I have a few other ergonomic travel products that make it easier to work as I travel. This setup includes a Roost Stand, nice mouse, and portable keyboard, among other things (talk about no longer traveling light!). 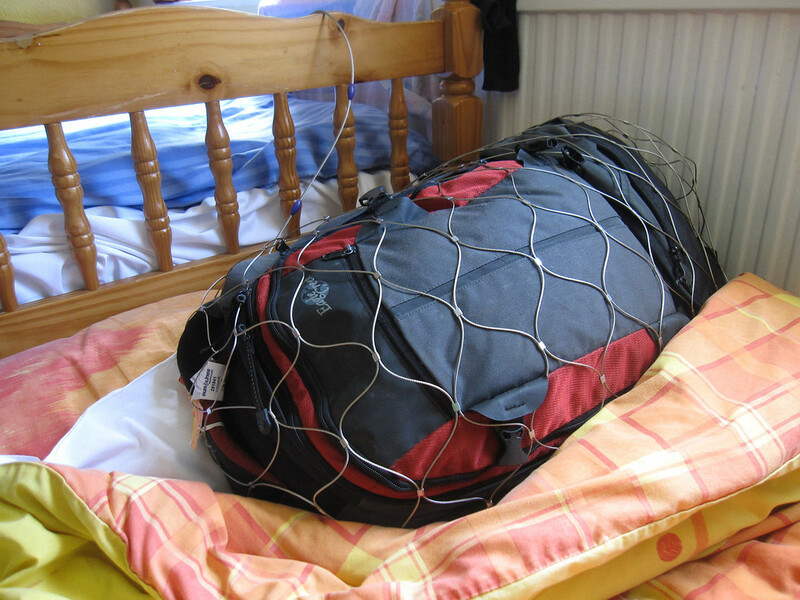 A 55L Pacsafe on my backpack and attached to the bedpost so I could go hiking with a bit of an easier mind about my laptop that was inside my backpack. Efficiency. 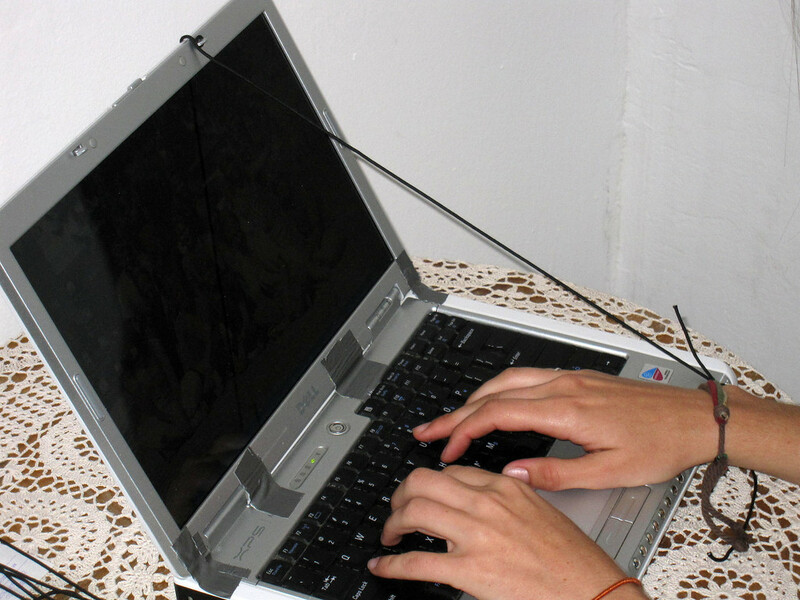 A laptop allows you to pre-write posts, upload and sort photos, and draft emails all from a hostel or train. It takes a lot of time to run a travel blog and long train rides (a few trains/buses even have power outlets!) provide the perfect opportunity to catch up on work and get information ready for the next time you find internet. More connectivity. Internet access is pervasive. That means that you can sip a hot tea from a small café and tap into wireless on your laptop. Wireless cafes are available from Laos to India and throughout Australia and Eastern Europe, not everywhere, but they’re there. Where there wasn’t good WiFi (parts of Africa), I could buy a local SIM card and hotspot myself (tether) from my phone. Storage. It’s nice to have one spot to upload your photos. Though this can be easily accomplished with an external hard drive or cloud storage, your own computer is invaluable for storing and sorting mass amounts of media. If you’re still torn about the laptop issue, you have a couple other options. If you’re not working from the road, then you really can get by without one and you’d likely do fine with one of these. This is a fantastic option if you’re running a casual travel blog to keep people updated, but it’s not an option for digital nomads. For blogging, if you can get photos onto your tablet (you will need an extra doohickey to read from a memory card for iPads), then the WordPress app will see you nicely through your entire trip. Most travel companies have incredibly effective apps now—from Airbnb to Kayak to TripAdvisor—and you can easily book and plan your long-term travel as you go. Skype is also a great app, you can knock out the need for a Kindle with the Kindle app, Netflix will work on the road (with a different selection of films), and tablets even allow you to easily edit photos and upload to your blog or social media. If you’re not working on client projects, you’re instead simply traveling the world, then a tablet is a pretty fantastic solution! To work effectively from one, you might want a wireless keyboard and some cloud storage, too. If emails and social media are your priority then a small smartphone might do the trick. This is barely adequate for travel bloggers, but just might meet your need for connectivity—it’s small and portable and less conspicuous than a laptop. If you don’t plan to edit a lot of photos, or you’re accustomed to doing everything from a smartphone anyways, then this is a great option. I would grow weary of just a smartphone on a long-term trip, but I think it could be excellent for trips of less than three months. This is a step up from the iPhone, but a step down from a full laptop. I carried a netbook on the Camino de Santiago in 2017 and it was absolutely perfect for my needs. Even though I had hoped to walk the Camino without client work, some deadlines made that impossible. So I packed it into my bag and it was everything I needed. They’re smaller and lighter than a full-sized laptop and have a longer battery-life. They connect to wifi signals and give you a screen bigger than your smartphone, and a device that multi-tasks better than a table. A netbook is ideal if you simply want the comfort of a laptop for your long-term trip, or if your main business on the road is blogging. The primary issue you’ll encounter is storage space, so you will need to back up to the cloud if you plan on taking a lot of photos! If you’ve already started your travel blog and you’re looking for great resources to get your blog off the ground, I share companies I use and love for developing this very travel blog. And if you’re planning to start a travel blog, I have a how-to primer here. Ergonomic Travel System: This is the fully portable system I use to travel and work from the road. It includes detailed information on how to prevent injury when you are working online from cafes around the world. Content Machine: Use Content Marketing to Build a 7-figure Business with Zero Advertising: While this business model is not going to work for everyone, Dan makes some excellent points about content creation and marketing. A Little Question… Should You Start a Travel Blog Before Your Trip? My only concern would be the screen size and if I had to use Photoshop. I once used a Mac mini as a development machine, and though it had a better processor the rest of the specs were similar. It wasn't the best, but it was usable. So I would probably get one with a higher res screen and stick to mostly coding work, but I think something like a Dell Mini 10 can do 90% of what I currently do. And I'm willing to make that compromise for the drastic reduction in cost and weight. My iPhone has been great for travel. I mostly use it for Skype calling, Google maps/transit, and the Kindle app is indispensable for guidebooks. It's much nicer to pay $10 for a Kindle book that weighs nothing, than €25 for the same book that adds a pound to your bag, if you can even find a store that sells it (in English). As a freelance web developer I've also always taken my laptop with me. However I'm increasingly convinced that a netbook would be even better. It's a lot easier to lose/replace a $300 netbook and weighs half as much. Traveled to Costa Rica with a 15″ Mac have downsized to a 12″ and will probably move to a tablet as soon as they come out. You have a very infomative blog for people on the move. Pacsav is an ingenious product. Headed to China this may and will keep watching to see what else is going on here. surely we couldn't either travel without one! we are practically addicted to our mini dell notebook, it's just great, light (less than 1kg) and very compact. We only have one between Chris and I and that's why we are always fighting who is going to use it first. Next trip we will bring one each! It's just impossibile to travel without a computer if you are running a blog but also if you want to stay connect back home without the hassle of finding an internet cafe' when you need it, as you would find around many places to connect to a wireless connection even for free. Security is our only concerne but with our pacsafe we have piece of mind all the time when leaving it behind in a room or in our van and when we travel we always stuck it in our small daypack. popular than I thought when I bought mine two years ago! Yes I agree that kids today need exposure to virtual skills & a laptop is essential for lots of her communication with friends and roadschooling (like learning programming via free MIT Scratch, free digital libraries, Brain Pop, John Hopkins Univ. 's CTY program, violin & piano lessons with teachers in US, collaborating with kids & schools around the world, fun educational CDs, etc). That said, kids have growing brains that can be damaged by too much screen time, so we put a severe time limit on that, so she's not on it very much & we have a LOT of control on WHAT she is on which I think is important. She spends most of her time outdoors in nature, playing with other kids & reading, (also musts for kids!) but a laptop is essential for an extended travel kid. (FYI We've never had a TV her whole life & don't watch the one in Spain with UK channels, she has no wii, nintendo ds, ipod, can only watch 1 dvd a week etc, but she did get a MP3 player last year as a gift & is exposed to those other things through friends). Type of travel dictates the laptop decision and luckily we very rarely have to deal with the theft issue & almost never stay in hostels as they are too expensive for families. We have a pacsafe, but almost never use it. BTW, having both macs & PC has been VERY helpful for us, as there are times one or the other is the preferred choice. We bought her the macbook, but I ended up taking over that as we are mac people, but most kids educational programs work on PC's. Thus PC is least used, but very needed at times. (Twas a hard decision before we left, but worked well). For an open ended world tour like ours, there's no question really as it's our life line. We started out with 17in Macpro & 17 PC, soon dumped our top of the line quad phone & added a macbook for our kid. BEST investment on our trip!! interested in Web site redesigns and SEO work! It's a Sony Vaio model VGN TZ37GN. It's ultra light weight and I can pack it in a sleeve that fits in a handbag. There's probably a newer model now. I should upgrade to W7 though I'm not keen on reinstalling all the software. Can I travel with a laptop AND PBR? I'm planning to take mine with me mostly because I can't imagine being without Photoshop. And if I'm lucky enough to get some freelance design gigs as I go then I'd definitely need it. Thanks for this post. I've travelled round the world twice before, but next time I'm hoping to take my netbook with me as I've recently started travel blogging. 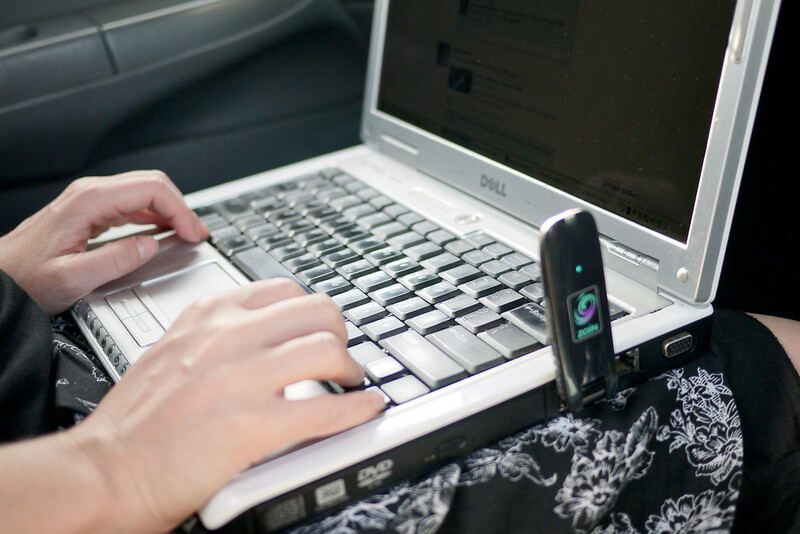 It's helpful to know what safety precautions to take to keep my gadgets safe on the road. I can't imagine travelling without a laptop. I download photos from 2 cameras, video, every day, use it to write and make use of travel time on plane and train rides. I'd be lost if I just had to rely on, say, an iphone. Mine is just a little larger than a netbook but with full functionality. Except it runs on Vista. Grrr. is pretty great – we have it on a computer at home and it's been stellar. I used to try and get away with traveling without the computer but found it impossible if you did much photo taking at all. I tried to take the little WD Passport Hard-Drives (300gig) but 1/2 the time i found computers in Egypt to Ecuador couldn't connect with it because they were so old. So i would have to get photos burned on to DVD and lost a lot of pictures because so. On top of that I got so sick of having to spend the first 10min in an internet shop on what keystroke makes the “@” sign!!! I could do a whole blog post about that but it drives me insane , esp since most keyboards are in English. Example: Ecuador has the @ sign but you can't use it, instead you have to hit Shift+6+4, then let go for it to apear… WTF??? I think it's practically essential since a laptop can act as a phone, research tool, photo backup, etc. It can be a hassle though worrying about it, especially if you've got a nicer one. Uglifiying your laptop (or laptop cover) with stickers is a good way to make it look cheaper, less re-sellable, and easily identifiable if someone in the hostel does take it. haha, me too. You can try putting an Invisible Shield or some other thin cover on first and getting all the stickers on there. Easier to un-ugly the laptop afterward. have the best ideas :-) I will look into getting one of those today! like this over the summer! I'm always with a laptop and recently bought the Acer Timeline 1810. It has all of the specs of a large laptop but is only slightly larger than a netbook (and weighs the same as a netbook). I'm absolutely loving it so far as it can handle even heavy programs such as dreamweaver and photoshop with ease. But I definitely agree, when traveling with any computer, a lot of time is spent worrying! hee hee hee. I'll just put on here for the record that my Dell Netbook was the best $300 I spent all last year- maybe ever. Granted, I wasn't gone for 11 months, but YOU know, Shan – even with the free-lancing work, it was more than perfect for me. Next time, I'll bring a external hard drive to account for the small one in the Mini, but how convenient was it that I could carry it (nearly) always in my Camelbak? And the fact that it was $300 means that even in a worse case scenario… I mean, replacement of a Mini is so much more feasible in a jam than a $1,500 laptop. Does the Pac Safe really work? I have been looking for something to feel more secure about my electronics on the road, I get a little worried even leaving my stuff in the lockers provided by the hostels. It seems like anyone who really wanted to steal my stuff/laptop could easily just cut the Pac Safe with a wire cutter and take my whole back pack. Or am I just thinking it looks a bit more flimsy than it actually is? they are FAR more likely to go for the nearby packs w/out anything. Can't afford a net book or anything else right now, so laptop is the way to go for me! We are traveling with our laptops (one each!) and couldn't run our blog without it. We have been using the pacsafe and it helps ease our minds a lot. I don't think that I could have the computer and not have the laptop. If we are staying in a sketchy place it is good to know that it is securely locked to the bed. Sure they take up space, but I think it is needed. From editing video, pretyping posts before hitting the Internet cafe and going through hundreds of photos. A lot of work can get done while laying in bed at night. We are using our iphone as well and are starting to use it a lot more to check email and facebook etc. It saves time at the Internet so that we can spend time to focus on the blog. We are really loving the Iphone now. Great points all around Shannon! a whole lot harder for someone to walk away with your electronics! I think some readers are missing a point – there are people out there (like me) still drinking PBR! My wife take are laptops with us wherever we go, but we're traveling by car, not backpacking. If I were backing, I would still want a computer with me – a net book seems like the ideal choice. I have a Samsung NC-10 netbook and love it! With the advancements in today's technology, I think it's getting to the point where the question should be “Why wouldn't you?”. Although, my preference would be a netbook. It's a one stop check your email/write your blog post(s)/listen to music/watch videos/catch up with your favorite bloggers/redesign your website portal. It does so much for you without requiring a lot of space which is crucial when you are traveling. Great post, Shannon! A question I ask myself every time I'm packing… I find my answer varies depending on the trip in question. One of those “must-haves” for me, but sometimes I really do dream about taking a couple weeks totally away from my internet jobs! ;-) It really does add weight and other worries! I've never heard of a Pac Safe before, so thank you for bringing this to my attention. I am preparing for my trip and in the process of researching laptop options. My thinking is to get a Netbook … Thank you for the insight!